After previously failing to address the real issues being faced by owners of its premium priced laptops, Apple has finally admitted that modern MacBook laptops suffer from tricky and sticky keyboard issues. Due to the design of the butterfly key mechanism, heralded as an enhancement at launch, it seems to be much more susceptible to dirt ingress and therefore malfunction compared to more traditional scissor mechanism keys. HEXUS reported on the introduction of the first MacBook's with the butterfly switch design way back in March 2015. The switches debuted on the thin and light MacBook, which Apple claimed "reinvents the notebook," otherwise notable for including just a single physical I/O port (USB Type-C) which doubled as the charging port. Apple told the MacBook launch attendees that the butterfly switch mechanism helped it slim down the keyboard component of the laptop by 34 per cent. As indicated in the intro the butterfly switches have in the last three years, as they have been introduced in a growing roster of new laptops (at least 9 models), earned a reputation for poor reliability. For keys that were described as providing greater precision and four times greater stability, this can only be described as a failure. In June Apple issued a support article with instructions about how to clean its laptops fitted with the butterfly keyswitches. 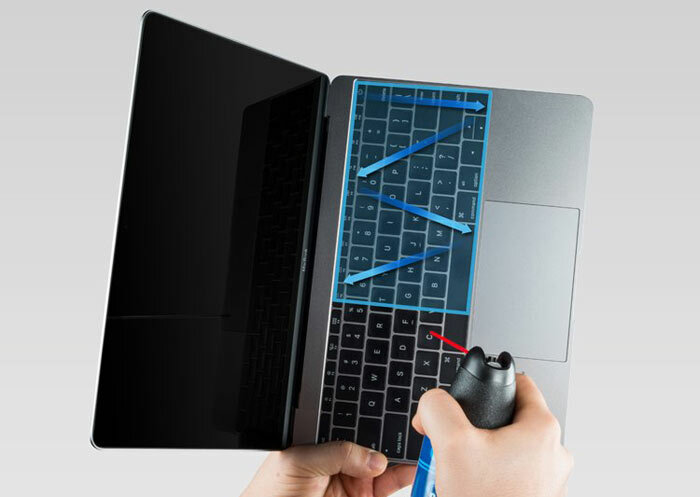 The task involved rotating and angling your MacBook while blasting compressed air into the keyboard at various angles. If the home remedy didn't work Apple advised afflicted users to visit an Apple Store and seek help. However, reports claim such trivial sounding repairs on machines out of warranty could cost in excess of US$700. In a change of heart, after prolonged user-base pressure and a number of lawsuits, Apple has published details of its Keyboard Service Program for MacBook and MacBook Pro. You can read the full post here but in summary it now agrees to "service eligible MacBook and MacBook Pro keyboards, free of charge". Depending upon the Apple engineer verdict on the state of your keyboard, it might replace one or more keys or the whole keyboard. If you aren't sure that you are affected by the MacBook butterfly switch issue, it manifests as letters or characters that repeat unexpectedly, letters or characters do not appear, and/or key(s) feel 'sticky' or do not respond in a consistent manner. It will be interesting to see what keyboard design is used on the next Mac portables and if the butterfly switch is either somehow sealed against dirt/dust ingress or simply discarded as a practical design. Its efforts with the "second-generation butterfly mechanism", introduced in new MacBook Pro laptops in October 2016, don't seem to have helped in this respect (these laptops feature in the free service repair list above). Gotta love the language apple chooses to use even though they designed a horrible keyboard made, useless by dust that users weren't able clean out themselves despite the compressed air picture. WHY did it take them so long to admit the design flaw? I have one of these Macbooks Pro… rubbishrubbishrubbishrubbishtiest computer ever, big mistake, will avoid Apple from now on. Maybe becuase Apple usually never admit to design flaws, they tend to blame the end user even when they know it's thier fault. Ah, antenna gate all over again. When they try and claim all phones have this issue. No, only the brand new iPhone4 would drop a call when picked up in our office, all other brands were fine. Yet people still buy them.